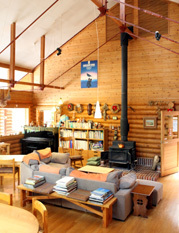 The lodge was hand built by the owner, with the assistance of family and friends, in 1983. 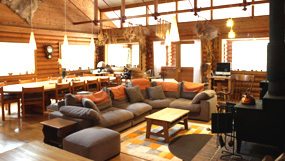 It is set in the beautiful, forest covered mountains of Hakuba and offers a relaxed, peaceful atmosphere for its guests. Two large luxurious baths are inside the lodge. 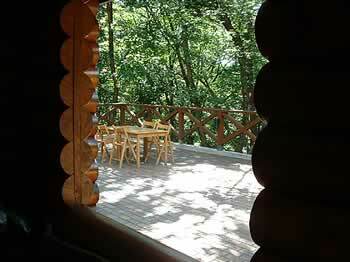 One bathroom has a large window that looks out amongst the forest. The lodge features on out door hot spring bath set amongst the garden. The water is renowned for its skin healing qualities. You can charge your electric vehicle during your staying. All of our meals are made from local, seasonal and organic food products. Our cooking is simple and tasty. The rice provided by our local farmers, Mr & Mrs Gozu, is grown without chemicals. Only natural fertilizers and the crystal clear spring water of Hakuba are used. The local milk is pasteurized by 65℃ for half an hour.It is very tasty. This region has various kinds of local Sake, many of which are available to sample at the lodge. The lodge has high speed wireless internet access and a computer in the living room, these are both freely available for all guests to use. Please refrain from smoking in the lodge. Copyright © Aozorakikaku Corporation. All Rights Reserved.